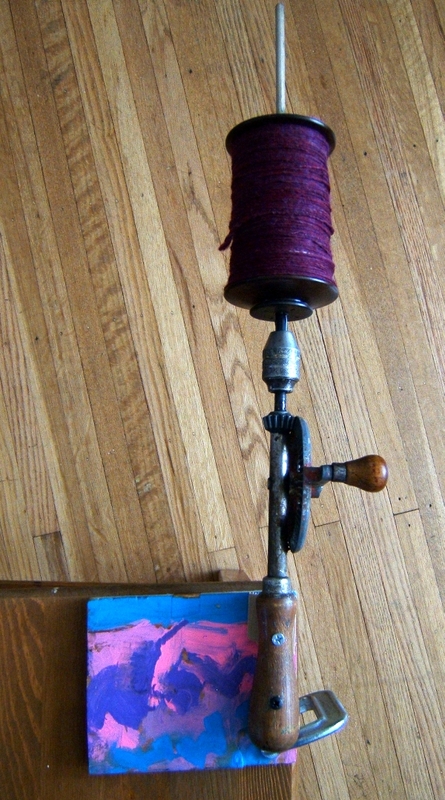 While we wait for Jan to come home from Hawaii with some beautiful photos, I thought I’d post pictures of my homemade bobbin winder. While I’d love to have one of those Swedish things with the tapered metal shaft, I can’t bring myself to pay $80 for one, so after the loom came to live with me a year ago I set about improvising a way to wind bobbins. 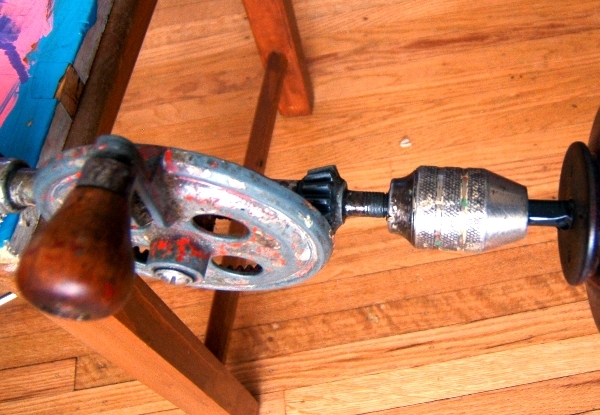 The Swedish winders remind me of nothing so much as the hand drills my dad had in his tool box, to use when an electric drill would be overkill, so I possessed myself of one of them ahead of time. Everything else, I had around the house. The dowel is 1/4 inch. I’d love to get a fatter one and sand it to taper, but that’s not on the short term action list! The C clamp was already here because I use it with my English combs. The piece of wood was painted by Emmy at some point. 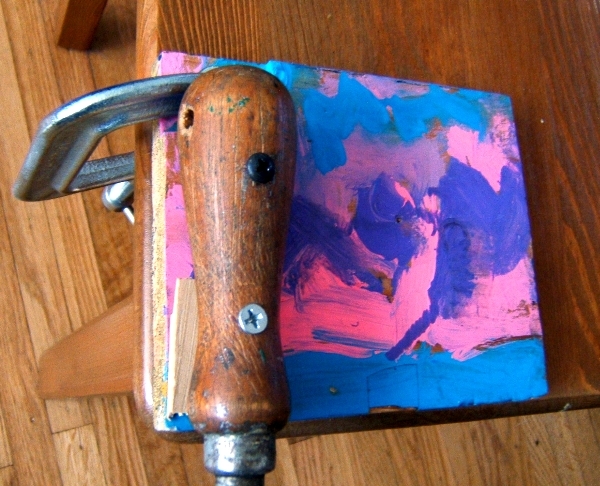 I started by drilling holes on the handle into the wood to attach it. Because of the tapered shaping of the handle, I put a shim under one of the screws to get it to be steady. I put some electrical tape on the end of the dowel up against the drill chuck, so I could ram the bobbin onto something to hold it in place. At the other end is a rubber grommet that I push tightly against the bobbin to assist it in staying put instead of revolving uselessly on the dowel. By paying close attention to what I’m doing, and adjusting the tension on the drive band of the wheel I’m winding off of, I can get some reasonably well packed singles. 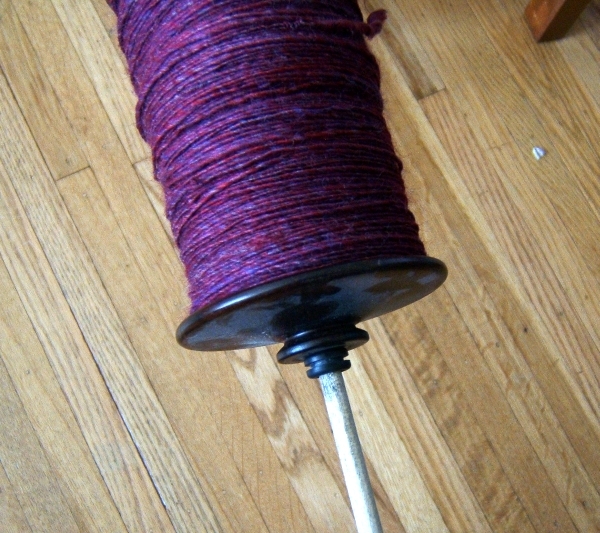 This bobbin is one of my Kromski ones that works on my tensioned kate, but I can also wind onto large-size plastic storage bobbins. For winding the small bobbins for the boat shuttles, I’ve turned to a $6 battery-powered drink mixer that I got on Amazon (I saw this tip on someone’s blog somewhere), but this works well for everything else.